Gold Chocolate Coins come in 100g, 400g, 1kg and 5kg . Use for corporate functions, promotions or even loot bags at Pirate parties. 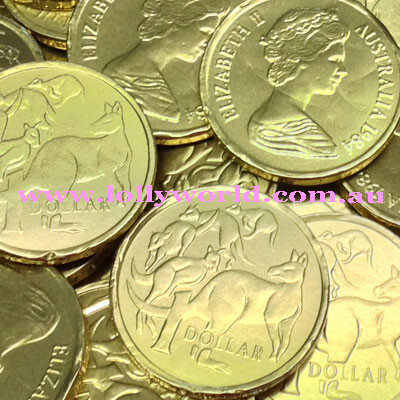 The Gold Chocolate Coins are commonly used at trade shows and also conventions by businesses as table decorations and give aways. Each chocolate coin depicts an Australian $1 coin on front and back of the coin. The Chocolate Coins are 40mm in diameter. 400g contains approx 64 Chocolate Coins. 1kg contains approx 160 Chocolate Coins. 5kg contains approx 800 Chocolate Coins. Gold Chocolate Coins come in 100g, 400g, 1kg and 5kg. Use for corporate functions, promotions or even loot bags at Pirate parties. The Gold Chocolate Coins are commonly used at trade shows and also conventions by businesses as table decorations and give aways. Each chocolate coin depicts an Australian $1 coin on front and back of the coin. The Chocolate Coins are 40mm in diameter. 24 x 80g Bags of Milk Chocolate Coins with Gold Foil. Each Mesh bag contains approx 14-16 Chocolate Coins.